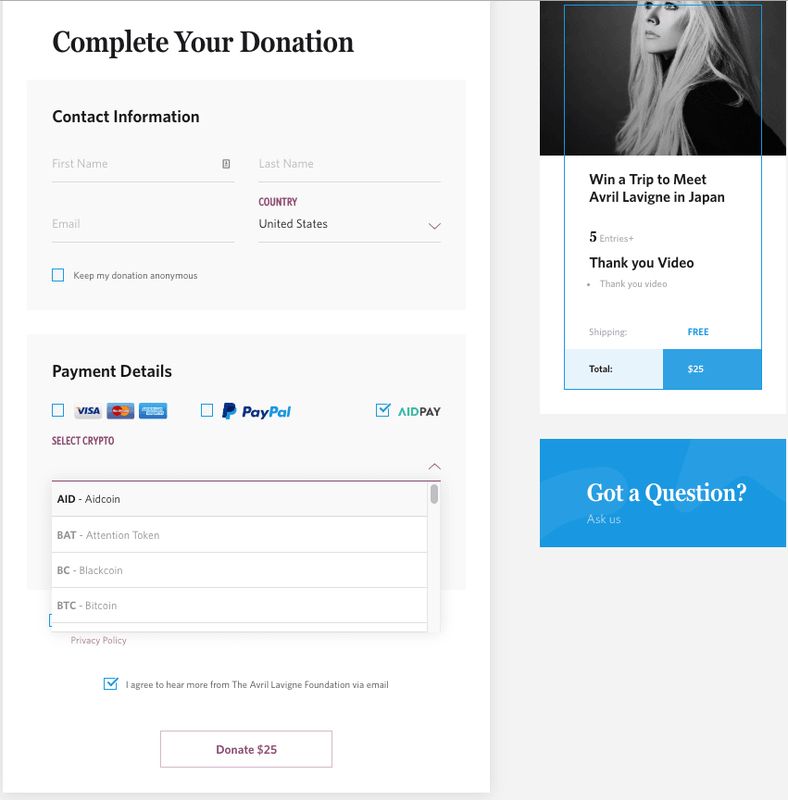 Want to fly to Japan with Avril Lavigne for $10 while helping charity? 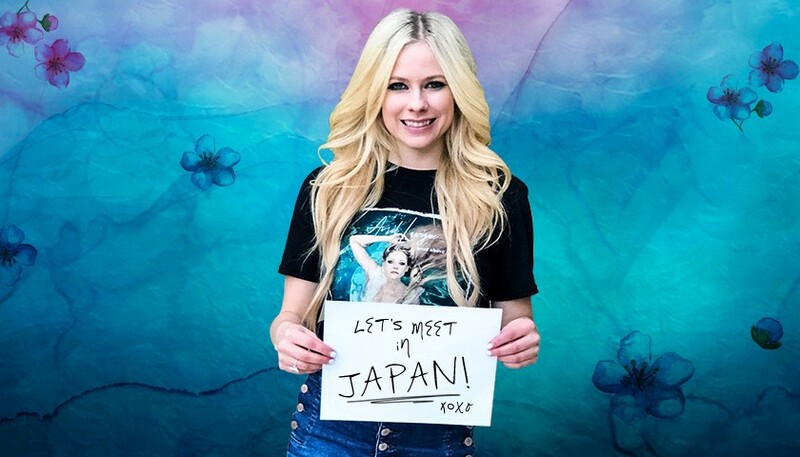 Want to fly to Japan with Avril Lavigne for $10 while helping charity? Simply test our brand-new crypto sweepstake feature! We’ve built AIDPay into one of the coolest features of the CharityStars platform — sweepstakes — and now you can win a trip to Japan by simply testing this new feature: donating as little as $10 worth of crypto. Here’s how! 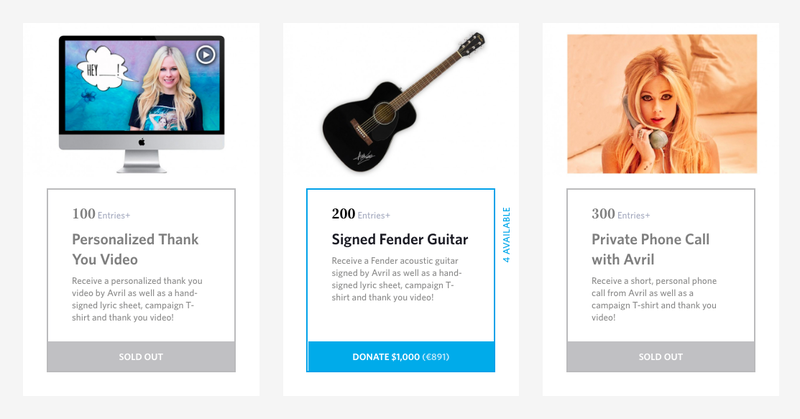 Auctions are not the only way to get cool items and experiences at CharityStars while supporting charity — you can also do so through sweepstakes. There are two options to participate in sweepstakes: first, you can simply donate as little as $10 (which equals one entry) to get a chance to win the main prize. Whether you win the prize or not, this money is not refundable and will go to the benefiting charity. Second, you can donate a bigger sum (several entries) to guaranteedly receive a cool side reward related to the main prize while also having a chance to win the main prize. In the end, the more you donate, the higher your probability to win, but no matter how much each person donated, everybody has a chance to get the main prize as the winner will be picked randomly. Up until now, donating to sweepstakes has only been possible in fiat. But as we deepen our platforms integration in search for new ways to motivate CharityStars’ charities to sign up on AIDChain, we find more ways to transparently raise crypto donations — now also through sweepstakes. What is the first CharityStars’ sweepstake to accept crypto donations? All the money raised in crypto through this sweepstake will be converted to DAI and donated to The Avril Lavigne Foundation which supports people with Lyme Disease, serious illness or disabilities. The charity will then spend the money transparently through AIDChain. How can you participate to win the trip to Japan? In fact, it’s as easy as making a donation on AIDChain but to ensure a hassle-free experience for you, we’ve prepared this step-by-step guide. 1) Choose the donation amount and you’ll be redirected to the donation page: you can either make just a minimum donation or donate more to get some cool side rewards. 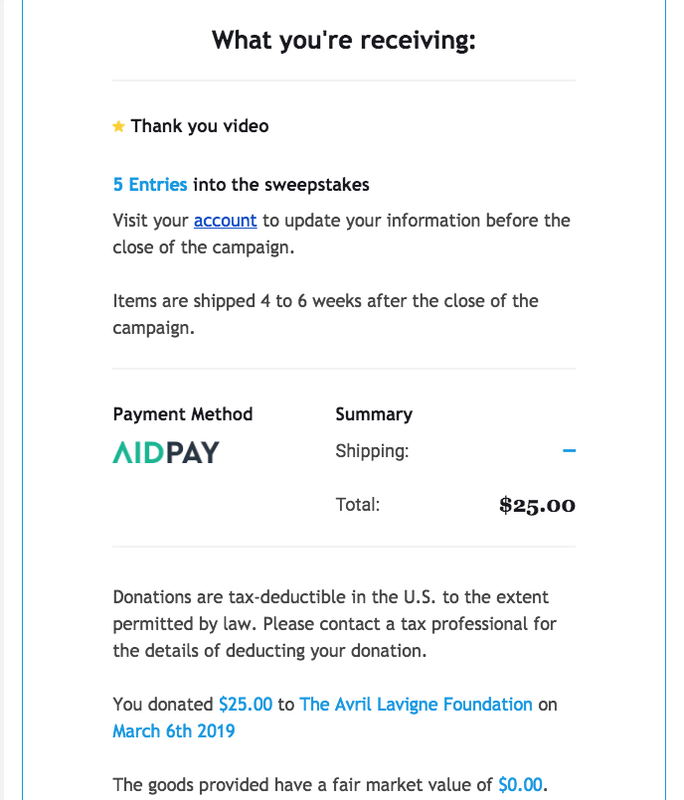 In our case, we chose to donate $25 so that we not only get the chance to win the main prize but also get a guaranteed side reward — a Thank you video from Avril. 2) Here you can fill in your basic contact info so we can provide you with a donation receipt eligible for tax deduction. In order to make a crypto donation put a tick in the AIDPay box in the Payment Details section and choose in which cryptocurrency you want to be charged. 2) Say, you’ve chosen BTC. 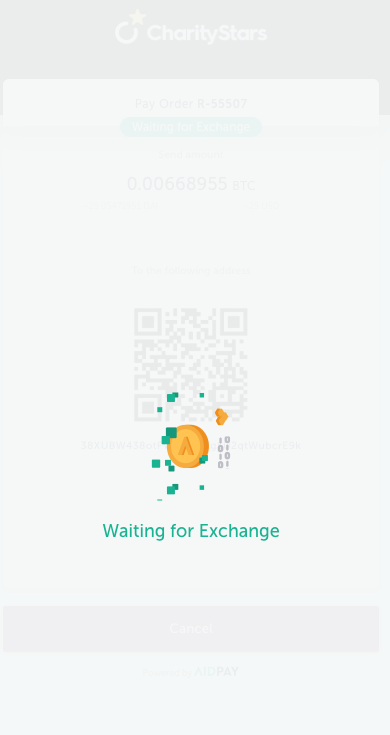 Now you need to make a transaction, just like it usually works with AIDChain donations. 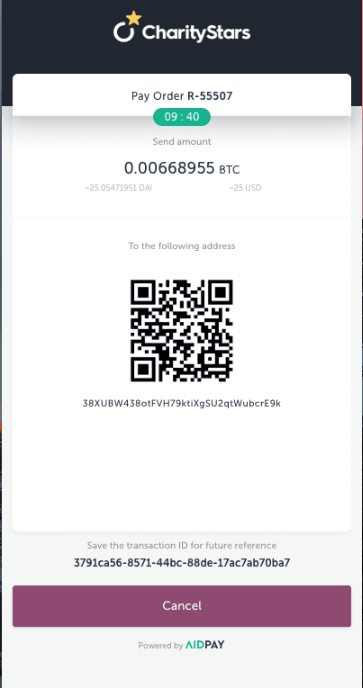 Please note that the BTC block time is 10 minutes so it will take longer to process your transaction than if you donated in ETH or other cryptos. 3) Hooray, your donation is done! 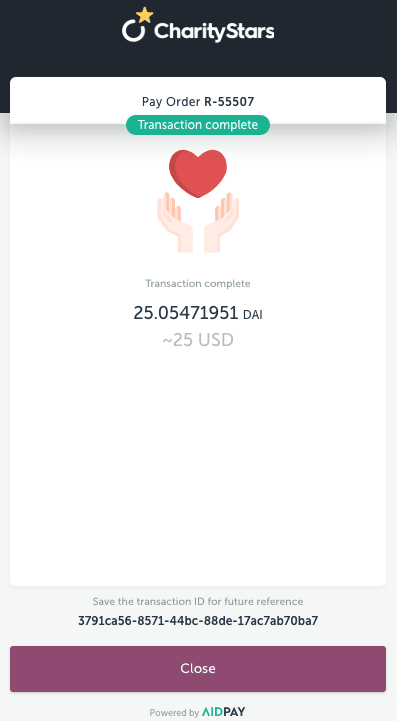 At this stage, your crypto gets converted to DAI stable coins and sent to the sweepstake's wallet from where it’ll be transferred to the charity’s wallet on AIDChain once the campaign is closed. Also, you’ll receive sent you a tax receipt eligible for a tax deduction to the email you’ve provided on the first page. Read our post about tax deductions for crypto donations here. We work hard to make transparent fundraising & funds management a wide-spread practice by onboarding as many charities as we can on AIDChain. Throughout the past year, we’ve tried many ways to motivate charities to join but what works the best is to secure a flow of donations for them first and then unfreeze it once they’ve registered. That’s why campaigns like this are so important for us: even the tiniest crypto donation you make increases the benefiting charity’s desire to register on AIDChain and receive the overall donation. One more reason for making a crypto donation to this campaign is that 15% of the total amount raised in crypto — which is the CharityStars’ fee for fundraising services — will be used to buy AidCoins on exchange and burn it thus reducing the overall AID token supply. We’ve already done so in our previous campaigns with ETHDenver and Vivienne Westwood and will keep doing so in the future. And finally, not only might you head on an amazing journey to Japan almost for free or help promote new transparent practices in the charity sector but also pay fewer taxes! Check out our article about tax deductions for crypto donations and why it’s more profitable to donate crypto instead of fiat. So come on, dust off the fluff from your crypto wallets and try your chances to win this awesome trip! Even if you don’t win the prize, you don’t lose anything — just deduct this money from your taxes and enjoy the fact that you’ve helped the people in need and contributed to the AidCoin’s growth! 😊 Thank you guys for your support and we will be back soon with the results of the campaign! Make your first trackable crypto donation here! Learn more about the AIDChain platform and the AIDPay widget. Can’t find your favorite charity on AIDChain? Send us info about it at hello@aidcoin.co and we’ll invite it to AIDChain! Subscribe to our Telegram, Twitter, Facebook and the newsletter on our website https://www.aidcoin.co to be the first to hear the good news!